Historically, groundwater has been naturally very clean because of this filtering effect. However, increased use of chemicals in everyday life means that groundwater is now vulnerable to the same pressures as water at the surface. 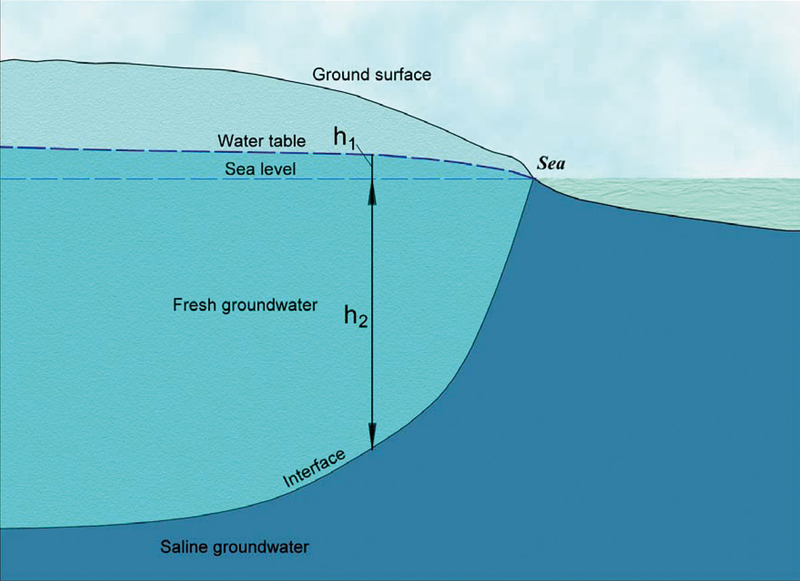 Since water continuously flows from one to the other (See figure 1), groundwater can become polluted with nutrients or chemicals when surface water carrying these substances drains into the groundwater environment. Since water continuously flows from one to the other, groundwater can become polluted with nutrients or chemicals when surface water carrying these substances drains into the groundwater environment. When groundwater is used at rates which are greater than the rate at which it is replaced by natural processes, its level within an aquifer drops. This will happen naturally during the summer and may be protracted in drought years. However, prolonged abstraction for water supply purposes above the rate that an aquifer can support can impact rivers, wells and wetlands connected to the aquifer. Wildlife habitat and recreational fisheries and boating will be negatively affected where excessive groundwater use impinges on river water supply. Where there is less water entering a river, the chemical quality of the river can suffer since the dilution of any chemicals present will be reduced and this can lead to fish death. Over-abstraction is being more widely identified as a problem and water companies and environmental protection bodies are increasingly working together to remedy the situation. Freshwater in an aquifer near the coast will exist in balance with the salt water which is contained in the aquifer beneath the sea. Salt water is heavier than fresh water so at the margin between fresh and salt waters it will lie underneath the fresh water. The boundary between the two moves through the year, moving further out to sea when winter rainfall increases the pressure and volume of freshwater in the landward side of the aquifer. Where freshwater abstraction from the coastal aquifer is not in equilibrium with the flow and ebb of these two bodies of water, salt water can intrude into the zone of freshwater abstraction and reduce the quality of water supply. This is termed saltwater intrusion and it is particularly prevalent in hot climates where fresh water is in short supply. The southern coast of Spain suffers saline intrusion because freshwater abstraction for the tourist and horticultural industries exceeds the ability of the freshwater aquifer to supply. However, saltwater intrusion also occurs in the UK where there is excessive abstraction from coastal aquifers. 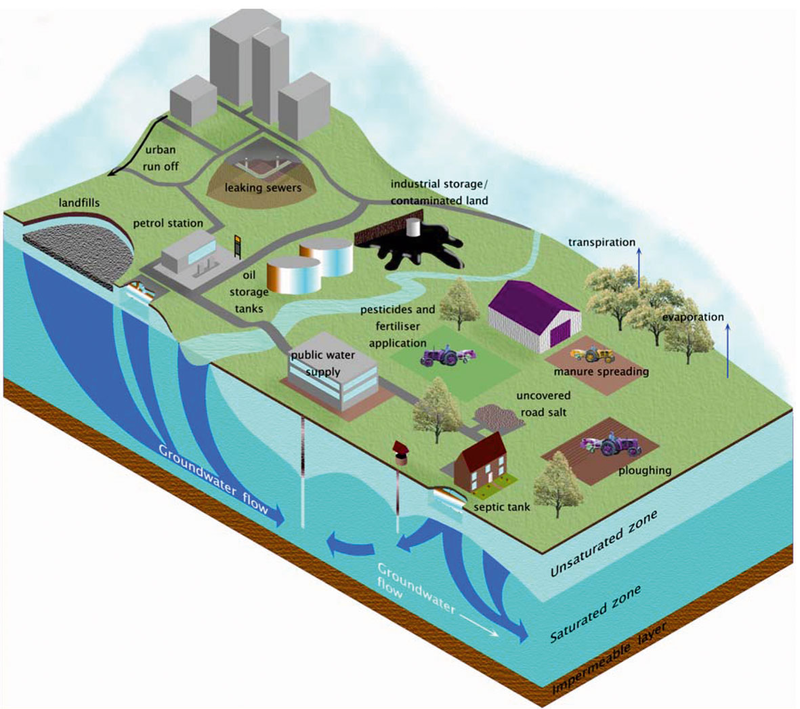 There are several ways that groundwater may be protected from contamination. The spillage of substances which may cause pollution should be avoided through the use of good management practice. Fertilisers should be used in a fashion which maximises their use by the crop and minimises leaching losses to rivers and groundwater. This is the objective of creating Nitrate Vulnerable Zones (see below). Drinking water supplies may be protected by defining source protection zones within which development is limited in order to reduce the chance of spillage of potentially polluting substances. The size of the source protection zone will depend on the geology of the aquifer, including how fissured (cracked) the rock is, and hence how fast the groundwater is travelling through it. The degree of sensitivity is dependant on the proximity, with development being more restricted close to the point of abstraction. The innermost zone is within 50m of the abstraction point, while Zone I is defined by the distance a particle of water travels through the saturated zone in 50 days, by which time pathogens should be absent. Prohibited development in these zones would include a petrol station or landfill site. Two further zones at a greater distance from the borehole are also defined in which such development would be discouraged. Nitrogen is a major plant nutrient and nitrate is the form in which nitrogen arising primarily from nitrogen fertilisers leaks into water, particularly groundwater. The loss of nitrate in soil water drainage is termed leaching. Agriculture is the primary source of nitrate in groundwater. Nitrate Vulnerable Zones have been identified in order to reduce the loss of nitrogen from agricultural land. Nitrate Vulnerable Zones (NVZ) were introduced by the Nitrates Directive and have developed in two phases since 1998. From 1 January 2009, the areas covered by Nitrate Vulnerable Zones (NVZs) were increased to approximately 70% of England. This includes the 55 per cent originally designated in 2002. Within these zones, certain agricultural practices have to be adhered to in order to minimise nitrate leaching.These measures include limiting the total amount of nitrogen that can be applied in animal manures in any one year and defining strict periods when neither commercial fertiliser nor organic manures can be applied, and defining good practice for the use of nitrogen fertilisers on farms. The primary objective is to prevent nitrate entering groundwater in order that potable supplies do not exceed the EU maximum permissible concentration of 50mgl-1 nitrate. The Protection of Water Against Agricultural Nitrate Pollution Regulations (Northern Ireland) 2004 established Northern Ireland as the area to which an action programme will apply, under the Nitrates Directive with no requirement to designate specific NVZs. The groundwater level under London is rising rapidly – up to 3m per year in places and becoming problematic to many public buildings and private homes. London is located on chalk which has been used for private and industrial water supply for a great many years. Deterioration in the water quality within the aquifer, due to urban and industrial pollution, has led private operations to become connected to the public water supply system. This, coupled with the closure of heavy industry and ceasing of their water abstraction, means that water in the aquifer is rising and coming to the surface at points where buildings are now located. The resolution to this is costly and needs to be tackled strategically to be effective.